Situated in Nocera Inferiore, this bed & breakfast is 2.8 mi (4.5 km) from Basilica di S. Alfonso M. De' Liguori and within 12 mi (20 km) of Pompeii Archaeological Park and Parco Regionale dei Monti Lattari. Shrine of the Virgin of the Rosary of Pompei and La Trinita della Cava Abbey are also within 12 mi (20 km). Situated in Nocera Inferiore, this hotel is 2.1 mi (3.4 km) from Basilica di S. Alfonso M. De' Liguori and within 9 mi (15 km) of Parco Regionale dei Monti Lattari and La Trinita della Cava Abbey. Ceramics Museum and Church of San Giovanni Battista are also within 9 mi (15 km). Nocera Inferiore Station is 17 minutes by foot and Nocera Inferiore Mercato Station is 20 minutes. 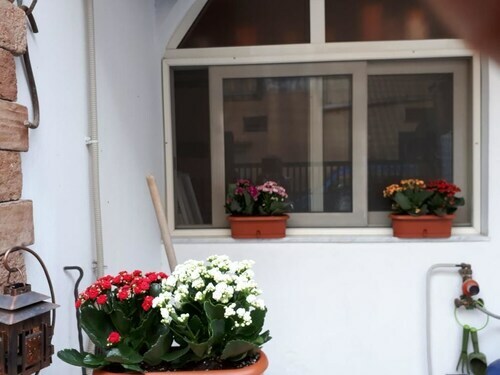 Situated in Nocera Inferiore, this bed & breakfast is 2.4 mi (3.8 km) from Basilica di S. Alfonso M. De' Liguori and within 9 mi (15 km) of Parco Regionale dei Monti Lattari and La Trinita della Cava Abbey. Ceramics Museum and Church of San Giovanni Battista are also within 9 mi (15 km). Nocera Inferiore Mercato Station is 7 minutes by foot and Nocera Inferiore Station is 20 minutes. 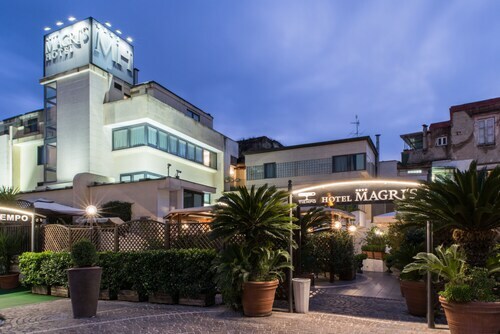 Situated in Nocera Inferiore, this hotel is 1.3 mi (2.1 km) from Basilica di S. Alfonso M. De' Liguori and 3.1 mi (5 km) from Parco Regionale dei Monti Lattari. Shrine of the Virgin of the Rosary of Pompei and La Trinita della Cava Abbey are also within 9 mi (15 km). Nocera Inferiore Station is 7 minutes by foot and Pagani Station is 21 minutes. 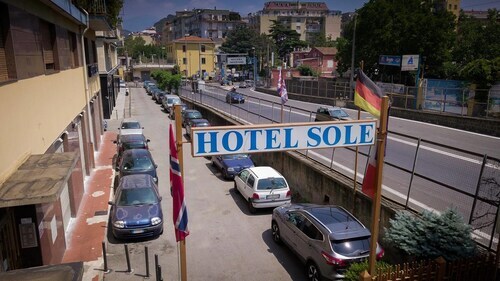 How Much is a Hotel Room in Nocera Inferiore? Hotels in Nocera Inferiore start at $56 per night. Prices and availability subject to change. Additional terms may apply. Nocera Inferiore offers travelers a wide selection of comfortable hotel and apartment options. You will find no less than 27 places to stay just a short drive from central Nocera Inferiore on Travelocity's informative lodging database. 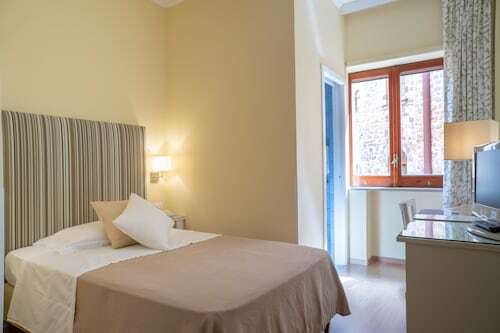 A good option amongst just a few Travelocity-listed rooms that are close to the center of downtown Nocera Inferiore, is the Hotel Santa Chiara. 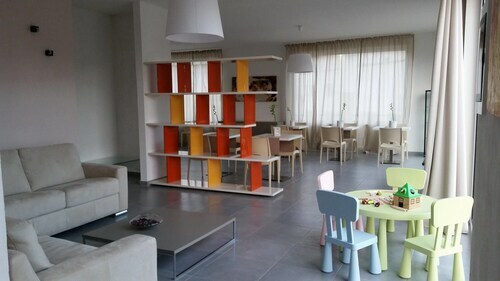 12 miles (19 kilometers) away from the town center of Nocera Inferiore, you will come across the Le Sirenuse. 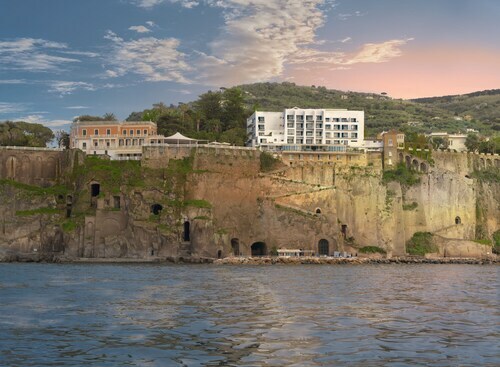 Alternatively, the Monastero Santa Rosa Hotel & Spa is located about 10 miles (16 kilometers) away. Some other hotel options in the Nocera Inferiore area include the Santa Caterina and the Casa Angelina Lifestyle Hotel. Why not broaden your horizons and visit the many other attractions of Campania during your stay in this region? Campania is well known for its beaches, coastal plains, mountains and active volcanos, and other commonly visited visitor places of interest are ruins and castles. Common activities in this region of Italy include mountain climbing, hiking and horse riding. 9 miles (15 kilometers) away from Nocera Inferiore, you will reach Castellammare di Stabia, where you can spend the day exploring Stabia Archaeological Site and Villa Arianna. 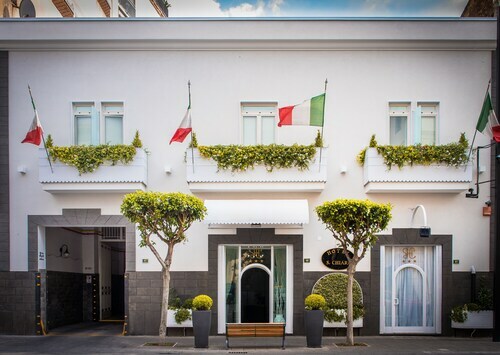 Some of our recommended Castellammare di Stabia hotels and apartments include the Plaghia Charter Boat&Breakfast and La Medusa Hotel & Boutique Spa. 7 miles (12 kilometers) to the west of Nocera Inferiore, you may also choose to stay at Pompei, which features the Villa Diomede Hotel and Hotel Palma. The Villa of the Mysteries and House of the Faun are other frequented attractions to see while in Pompei. Make sure you spend a few hours cheering wildly with some Mount Vesuvius - Pompei sports enthusiasts at a community game. Stadio San Paolo can be found 25 miles (38 kilometers) to the west of Nocera Inferiore. For those who like the thought of booking a bed in the area, book in the Grand Hotel Parkers or Hotel Micalo. Naples International Airport is a practical gateway for those flying into Nocera Inferiore. It is located 20 miles (33 kilometers) from the center of town. For wise travelers who would find it convenient to stay nearby, have a look at Romeo Hotel or La Ciliegina Lifestyle Hotel. Excellent staff, clean rooms, amazing view. Would stay here again. This property was not only beautiful inside but the grounds as well. We loved strolling the walkways and admiring the greenery. Plus this hotel is very clean and well appointed. The staff was amazing. They go out of their way to make sure you are comfortable and have everything you need. They are very service orientated and courteous. We loved this hotel and would stay here again if we return to the area. The hotel is OK, but it is located in an industrial zone. Wonderful hotel and staff. Breakfast was good with a wide variety of foods. Walking distance to shops and restaurants. Highly recommend. We had a fantastic stay at Hotel Prestige! 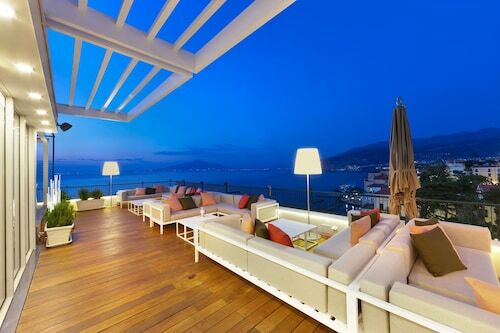 Very cozy place on top of the hill; fantastic view of Sorrento. The staff was amazing, they really took care of us! Extremely helpful and caring. The shuttle to and from Sorrento to the hotel was always on time,and the drivers were very friendly. Breakfast and dinners were great. We'd definitely stay there again.